Played in 72 games (72 starts) and averaged 11.9 ppg (.454 FG%, .365 3P%, .580 FT%), 6.0 rpg, a league-leading and team-high 11.7 apg (839 total assists were also a league high), 1.96 spg (7th in the NBA) and 35.2 mpg ... scored in double figures in 45 games, 20+ in seven ... grabbed 10+ rebounds in eight games ... dished out 10+ assists in 51 games (Sacramento-era single-season record) and 20 assists in two ... recorded 37 double-doubles and six triple-doubles (Sacramento-era single-season record) ... led team in scoring in four games, rebounding in seven and assists in 67 … posted season-high 27 points vs. POR (4/5) in a triple-double effort with 10 rebounds and 12 assists … tied season-high 20 assists vs. CHA (1/25) to go along with 7 points and 10 rebounds ... set season high of 20 assists to go along with 14 points, 8 rebounds, 4 steals and 1 block at CHA (11/23) ... recorded 300th assist of the season at WAS (12/21), becoming the fastest in Kings franchise history (27 games) to dish out 300+ assists in a season, according to Elias Sports Bureau; also fastest since Steve Nash (25 games) did it in 2007 ... missed one game (12/15) due to NBA suspension, one game (1/5) due to lower back spasm, one game (2/26) due to right thumb tendinitis, one game (3/16) due to right 1st MTP joint sprain; “turf toe,” right thumb sprain & right shoulder contusion and six games (3/28, 4/2, 4/7, 4/9, 4/11, 4/13) due to rest. Played in 645 games (592 starts) with averages of 11.0 ppg, 4.8 rpg, 8.7 apg, 1.84 spg and 32.9 mpg in 10 seasons with three teams - BOS (2006-07 - 2014-15), DAL (2014-15) and SAC (2015-16) ... holds career shooting marks of .468 from the field, .289 from three and .606 from the free throw line … in nine seasons with Boston, averaged 11.0 ppg (.473 FG%, .252 3P%, .614 FT%), 4.7 rpg, 8.5 apg, 1.88 spg and 32.9 mpg in 527 games (started 474) ... in only season with Dallas, averaged 9.3 ppg (.436 FG%, .352 3P%, .452 FT%), 4.5 rpg, 6.5 apg, 1.17 spg and 28.7 mpg in 46 games (46 starts) … led the league in assists per game in 2011-12 (11.7 apg), 2012-13 (11.1 apg) and 2015-16 (11.7 ppg) ... Celtics’ all-time leader in assists per game (8.5) and steals per game (1.9) ... holds the Celtics’ single-season assist record with 794 (2009-10) and single-season assist average with 11.7 apg (2011-12). Played in 68 games (68 starts) and averaged 8.9 ppg (.426 FG%, .314 3P%, .397 FT%), 5.5 rpg, 7.7 apg (5th in the NBA), 1.34 spg (35th in the league) and 29.7 mpg ... prior to being traded to Dallas, averaged 8.3 ppg (.405 FG%, .250 3P%, .333 FT%), 7.5 rpg, 10.8 apg, 1.68 spg and 31.8 mpg in starting all 22 games he played with the Celtics ... recorded three triple-doubles and 15 double-doubles (six with Dallas) ... had four games with 20+ points (three with Dallas) … had 29 games with 10+ points (20 with Dallas) … grabbed 10+ rebounds in seven games (one with Dallas) ... dished 10+ assists 20 times (seven with Dallas) … scored season-high 29 points at BOS (1/2) … grabbed a season-high 13 rebounds in a triple-double effort (13 pts/11 ast) vs. WAS (12/7) … handed out season-high 19 assists to go with 12 rebounds at ATL (12/2) … missed the game at CHI (11/8) due to a left hand procedure, one game with left Achilles soreness at DEN (1/14), left the game at ORL (1/31) in the first quarter with a left orbital fracture/nasal fracture and did not return and missed six games due to the injury (2/2-2/11), was NWT-team suspension at ATL (2/25), left the game vs. GSW (4/4) in the second half with a hyperextended left knee and did not return, and was DND-Inactive (rest) at DEN (4/10). 2015 PLAYOFFS: Appeared in two games (two starts) for the Mavericks and averaged 9.5 points, 1.0 rebound, 3.0 assists and 18.5 minutes. Played in 30 games (30 starts) and posted 11.7 ppg (.403 FG%, .289 3P%, .627 FT%), 5.5 rpg, 9.8 apg, 1.33 spg and 33.3 mpg ... led the Celtics in scoring four times, rebounds four times, assists 27 times, steals nine times, blocks once and minutes nine times ... recorded one triple-double and 13 double-doubles ... scored in double figures in 17 games, 20+ points in two games ... made his season debut with 8 points, 4 assists and 2 steals vs. LAL (1/17) … recorded his 4,000th career assist vs. DAL (2/9) … recorded season-high 22 points to go with 11 assists and 3 steals vs. ATL (2/26) … had double-double with 11 points, 18 assists, 2 steals and no turnovers vs. DET (3/9) and passed Bill Russell for 5th-highest assist total in Celtic franchise history … missed a total of 42 games due to injury: 39 to rehab from a torn ACL, right knee (10/30-1/13), two games due to a bruised left shin (4/11-4/12) and one game due to a strained left hamstring (4/16). Played in 38 games (38 starts) and averaged 13.7 ppg (.484 FG%, .240 3P%, .645 FT%), 5.6 rpg, a league-high 11.1 apg, 1.79 spg and 37.4 mpg … named as a starter for the Eastern Conference in the 2013 NBA All-Star Game in Houston … scored season-high 30 points vs. CHI (1/18) … recorded first triple-double of the season (16 pts/season-high 13 reb/14 ast) along with 3 steals and 3 blocks at PHI (12/7) … tied John Stockton for the second-longest streak with 10+ assists in a game at ORL (11/25) by recording 16 against the Magic, which marked his 37th consecutive game with 10+ assists (also a career-long streak) … had streak snapped the next game when he was ejected just before halftime for an altercation … dished out season-high 20 assists vs. TOR (11/17) and vs. PHI (11/9) … suffered a torn ACL in right knee at Atlanta (1/25) and was ruled out for the remainder of the season on 1/27 (44 games). Played in 53 games (53 starts) and averaged 11.9 ppg (.448 FG%, .238 3P%, .597 FT%), 4.8 rpg, league-high 11.7 apg, 1.79 spg and 36.9 mpg ... became the first Celtic to lead the NBA in assists per game since Bob Cousy during the 1959-60 season … named to the Eastern Conference All-Star Team as a replacement for Joe Johnson and had 2 points, 2 rebounds and 8 assists in 16 minutes in the All-Star Game … was named as a replacement for Stephen Curry for the Taco Bell Skills Challenge at All-Star weekend and finished in 2nd place ... tied season-high 20 assists in triple-double effort (10 pts/10 reb/20 ast) vs. ATL (4/11) … recorded triple-double with 18 points, a career-high 17 rebounds and a season-high 20 assists vs. NYK (3/4), becoming the first player to hit such numbers since Wilt Chamberlain recorded 22 points, 25 rebounds, 21 assists on 2/2/68; Rondo and Magic Johnson are the only two players since 1983 to record 17+ points, rebounds and assists in a game … scored career-high 35 points vs. DET (2/15) … posted 15th career triple-double with 32 points (11-22 FG, 10-13 FT), 10 rebounds and 15 assists vs. CHI (2/12), becoming the first player in more than two decades to record a 30-15-10 triple-double with 10 FGM and 10 FTM in a non-OT game (joining Magic Johnson, Michael Jordan, Hakeem Olajuwon and Larry Bird as the only players to accomplish that feat since 1980 – with Olajuwon’s being the most recent in 1989) … appeared in his 400th career game vs. CHA (2/7) … recorded his 3,000th career assist vs. CHI (1/13) … passed K.C. Jones for 8th place on the Celtics all-time assist list on opening night when he recorded 13 assists to go with his 31 points, 5 rebounds and 5 steals at NYK (12/25) … missed four games due to injury. 2012 PLAYOFFS: Appeared in 19 games (19 starts) with averages of 17.3 ppg (career playoff high), 6.7 rpg, league postseason-high 11.9 apg and 2.37 spg in 42.6 mpg … notched four triple-doubles in the postseason … scored a playoff career-high 44 points to go with 8 rebounds, 10 assists and 3 steals in 53 minutes in Game 2 of the Eastern Conference Finals at MIA (5/30), became the first player in NBA postseason history to record those totals in a game … became just the second player in NBA playoff history to record 13+ assists in the first five games of a series (joining Magic Johnson) when he did so in Games 1-5 vs. PHI … averaged 14.1 ppg, 7.4 rpg and 12.7 apg vs. PHI; only one other player has matched or bettered those totals for a seven-game series: Magic Johnson against BOS in 1984 NBA Finals: 18.0 ppg, 7.7 rpg and 13.6 apg. Played in 68 games (68 starts) and averaged 10.6 ppg (.475 FG%, .233 3P%, .568 FT%), 4.4 rpg, 11.2 apg (2nd in the NBA), 2.25 spg (2nd in the NBA) and 37.2 mpg ... led the team in scoring four times, rebounds seven times, assists 65 times, steals 37 times, blocks once and minutes 30 times … posted a team-high 31 double-doubles … scored in double figures in 36 games, 20+ in five games … named to his second consecutive All-Star Game as a member of the Eastern Conference reserves … had second triple-double (12 pts/10 reb/23 ast) to go with a season-high 6 steals vs. SAS (1/5) … recorded first triple-double of the season (10 pts/10 reb/career-high 24 ast) vs. NYK (10/29) … set the NBA record for most assists through four games (67) previously held by John Stockton and Magic Johnson (65) … tallied season-high 26 points vs. ORL (2/6). 2011 PLAYOFFS: Played in nine games (nine starts) and averaged 14.0 ppg, 5.4 rpg, 9.6 apg, 1.11 spg and 38.3 mpg … notched sixth career postseason triple-double (15 pts/11 reb/20 ast) at NYK (4/22), joining Magic Johnson as the only other player in NBA history to record a postseason triple-double with 20+ assists … dislocated his left elbow during the third quarter of Game 3 vs. MIA (5/7) but did not miss any games due to the injury. Played in a career-high 81 games (81 starts) and averaged 13.7 ppg (.508 FG%, .213 3P%, .621 FT%), 4.4 rpg, 9.8 apg, a league-high 2.33 spg and 36.6 mpg ... led the NBA in total steals (189) … recorded 10+ assists in 45 games … led the Celtics in assists in 80 games, in points 14 times, in rebounds 13 times and in steals in 56 games … had two triple doubles and a career-high 40 double-doubles … earned his first All-Star Game appearance when he was named as a reserve to the 2010 Eastern Conference team … became the first Celtic since Sherman Douglas to record five 15+ assist games in one calendar year since Douglas had five in 1993 … handed out a season-high 18 assists vs. SAC (3/26) … played his 300th career game vs. DET (3/15) … tallied season-high 30 points to go with 15 assists and 3 steals at GSW (12/28), becoming just the third Celtic to post 30 points and 15 assists in the same game (joining Larry Bird and Bob Cousy) … pulled down a season-high 13 boards at ORL (12/25) … recorded 11 points, 9 rebounds, 13 assists and 5 steals vs. MIL (12/8), becoming the first Celtic to post those numbers since the Elias Sports Bureau began tracking steals during the 1973-74 season … missed game vs. TOR (1/2) due to a strained left hamstring. 2010 PLAYOFFS: Played in 24 games (24 starts) and averaged 15.8 ppg (.463 FG%, .375 3P%, .596 FT%), 5.6 rpg, 9.3 apg, 1.92 spg and 40.6 mpg … had two triple-doubles … became just the third player in NBA postseason history to record a triple-double of 29 points, 18 rebounds and 13 assists vs. CLE in Game 4 of the Eastern Conference Semifinals (Oscar Robertson, Wilt Chamberlain) … recorded 21 points, 12 assists and 5 steals in the deciding Game 6 vs. CLE (5/13), marking the fifth time a player recorded those numbers in a deciding game in which his team was the winner (Johnny Moore, Clyde Drexler, Michael Jordan, Jason Kidd) … moved into 6th place all-time in Celtics postseason history for assists. Played in 80 games (80 starts) and averaged 11.9 ppg (.505 FG%, .313 3P%, .642 FT%), 5.2 rpg, 8.2 apg, 1.86 spg and 33.0 mpg … among NBA leaders, ranked 6th in assists and 5th in steals … finished 5th in the NBA in total assists (659) … scored in double figures in 43 games, 20+ in 13 games and 30+ in two games … had 13 double-doubles and two triple-doubles … scored season-high 32 points on his 23rd birthday at PHX (2/22) … dished out a season-high 17 assists twice (12/3 vs. IND, 2/27 vs. IND). 2009 PLAYOFFS: Appeared in 14 games (14 starts) and averaged 16.9 ppg (.417 FG%, .250 3P%, .657 FT%), a playoff career-high 9.7 rpg, 9.8 apg, 2.50 spg and 41.2 mpg … joined Larry Bird as the only Celtics to have posted three triple-doubles in the same postseason. Played in 77 games (77 starts) and averaged 10.6 ppg (.492 FG%, .263 3P%, .611 FT%), 4.2 rpg, 5.1 apg, 1.68 spg and 29.9 mpg … among NBA leaders, ranked 13th in steals, 35th in FG% (.492) and 22nd in assists (5.1) … named to the T-Mobile Rookie-Sophomore Challenge and Youth Jam where he was a starter recording 6 points and 6 assists in 18 minutes of action … scored 20+ points in eight games … dished out 10+ assists in six games ... led Celtics in assists 36 times, in rebounds five times and in scoring twice … became the first Celtic since Sherman Douglas in 1995 to record 15+ assists in a game when he dished out a season-high 16 assists vs. CHA (2/29) … tallied season-high 24 points vs. LAC (2/6) … grabbed season-high 12 boards vs. DAL (1/31) in double-double effort with 14 points. 2008 PLAYOFFS: Played in 26 games (26 starts) during the Celtics’ championship run … averaged 10.2 ppg (.407 FG%, .250 3P%, .691 FT%), 4.1 rpg, 6.6 apg, 1.73 spg and 32.0 mpg … had two double-doubles … recorded second-highest single playoff assist mark by a Celtic in postseason history (172) … recorded 16 assists in Game 2 of the Finals, the most recorded by a player since Magic Johnson had 20 assists in 1991 … had 21 points, 7 rebounds, 8 assists and 6 steals in 32 minutes in Game 6 of the NBA Finals vs. LAL (6/17) … his 6 steals in Game 6 tied for 2nd all-time in steals recorded in a single game (with John Havlicek, Steve Mix and Maurice Cheeks). Played in 78 games (25 starts) and averaged 6.4 ppg (.418 FG%, .207 3P%, .647 FT%), 3.7 rpg, 3.8 apg, 1.64 spg and 23.5 mpg … had 14 points, 8 rebounds, 8 assists and a then-career-high 7 steals at IND (4/7) … grabbed a season-high 14 boards at SAS (3/17) … had 12 points, 8 assists and 7 boards in a season-high 47 minutes vs. CHI (3/11) … dished out a season-high 11 assists at DET (2/6) … in first career start, tied season high of 23 points to go along with 6 rebounds, 6 assists and 4 steals vs. LAC (2/2) … recorded first career double-double with 10 points, 10 boards and 7 assists at WAS (1/20) … tallied season-high 23 points with 5 assists and 4 steals vs. TOR (1/12). Selected by Phoenix Suns in the first round (21st pick overall) of 2006 NBA Draft ... draft rights traded by Suns with Brian Grant to Boston Celtics for a first-round pick in 2007 draft (6/28/06) … traded with Dwight Powell to Dallas in exchange for Brandan Wright, Jae Crowder, Jameer Nelson, a 2015 first round pick and a 2016 second round pick (12/18/14) ... signed as a free agent with the Sacramento Kings (7/13/15) … signed as a free agent with the Chicago Bulls (7/7/16). 2005-06: Led the SEC in assists (4.9) and ranked second in steals (2.0), while averaging 11.2 ppg and a team-high 6.1 rpg … scored in double figures in 17 games … grabbed 10+ rebounds in five games … tallied career-high 25 points (7-12 FG) and 7 assists vs. Louisville … recorded a double-double with 15 points and 10 rebounds vs. West Virginia … pulled down a career-high 19 rebounds vs. Iowa, the highest total ever by a Kentucky guard … dished out a career-high 12 assists with no turnovers vs. Ole Miss … recorded 11 points, 8 rebounds and 6 assists vs. Connecticut in the second round of the NCAA Tournament. 2004-05: Named to the SEC All-Freshman Team … set Kentucky single-season record for steals with 87 ... had at least 1 steal in each game … tied Kentucky’s single-game record with 8 steals in just 20 minutes vs. Mississippi State … scored in double figures in his first three NCAA Tourney games … handed out a season-high 8 assists with no turnovers at Vanderbilt. 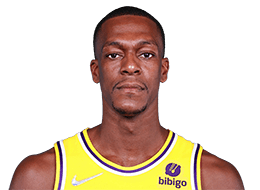 Full name is Rajon Pierre Rondo … son of Amber Rondo … attended Louisville’s Eastern High School for three years before transferring to Virginia’s Oak Hill Academy for his senior year … favorite NBA player growing up was Isiah Thomas … enjoys shopping in his spare time … favorite actor is Will Smith.